Our fourth year here and we finally got a trick-or-treater! As Halloween fell on a Tuesday this year we are actually home and passing out candy. Oddly, I thought it would a bit more gratifying. There was quite a bit of grabbing and less of the ‘thank you’ part. 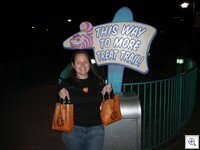 Apparently, it is better to be the trick-or-treater than the adult passing out candy. That is why Vlad has promised to keep up our yearly Not-So-Scary tradition at Magic Kingdom. That way I get to be the kid! We’re all partied out! Back in Orlando, putting together our place and beginning the process of unpacking. I just wanted to take a moment and say a huge thank you to everyone that was able to make it to our party. We really had a great time, it was nice to catch up with everyone, share all the happy moments we’ve had as a married couple so far, get great advice from people that have been married for some time….. and meet some of the family for the first time or at least under the happy circumstances for the first time. So, again, thank you all for coming! P.S. I know almost everyone asked to get a copy of the pictures. If you put your email address on the RSVP form, you’ll get an email with the username, password and the gallery address. Sorry, but certain things have to remain private and I can’t post all our albums here in public. 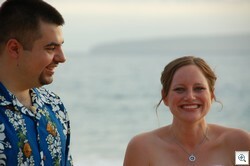 Yesterday, at sunset, Vlad and I got married on a beach in Makena on Maui. It was a perfect day. I had been worried about my dress, the make-up, and the weather but everything turned out better than expected. Special thanks to Pablo and Leigha for being such wonderful friends and even better video crew. Enjoy the brief video. Click here to download our video. P.S. It may take a few minutes to download! We are in Maui, having fun. Enjoy the pictures, hope to see you all at our party when we come back.